Ike takes a drive down the middle of the road. Before Dwight Eisenhower left Europe he was genuinely puzzled when certain of his visitors went away saying that in domestic politics he was “to the right of Taft.” The visitors, coming from an America where it has become customary to tag everyone as being right or left, had seen in some of his customary views evidence of a rightward domestic political inclination. Ike himself, however, is conscious only of a desire to find the right solution to any given problem regardless of what kind of people have generated the idea. This urge to find a right solution without finding one’s self labeled reactionary or radical is the overlooked key to the man Eisenhower and might well lead to considerable confusion before Ike and the American public get to know each other better. In foreign policy Ike is a modern American. But when anyone in these black and white days adopts what is plainly a modern point of view about foreign policy there tends to be an assumption that he must be quite as modern in other areas of public affairs and therefore as easily placed in the domestic political spectrum. That is precisely where a number of political experts are going wrong these days, because in domestic affairs Ike hasn’t had a chance to become modern. He left civilian life in 1910 and has been busy ever since building an army career, waging wars, and trying to remake the face of Europe. True, he had a few brushes with modern America when he was president of Columbia University, but it is important to remember that while he resided in the general environment of a great civilian university he continued to move through it within the immediate environment of a five-star general surrounded by aides and staff sergeants. Certainly not consciously, but just as certainly unconsciously, Ike looks ahead with the attitude of a man who is not just taking off a uniform, but who feels that he is going to move from the world of “we” to the world of “they.” So far as foreign policy is concerned the transition will be easy. In that area the two worlds have not exactly merged, but have intermingled to the point where the army recognizes, albeit with sadness, that political and military affairs can no longer exist in separate compartments. In domestic affairs it is bound to be a different story. This doesn’t mean for a moment that Ike will move into domestic affairs unequipped to comprehend or deal with them. The America of 1910 in Abilene, Kansas, does not prepare a man to grasp instantly the subtleties of Senator Taft’s relation with Joe McCarthy or the reasons why it is more respectable for a member of the N.A.M. to be seen lunching with John L. Lewis than with Philip Murray. But it isn’t a bad starting point for a new look at 1952’s America. After all, people from small Midwest towns in 1910 were decent people capable of tolerance for each other’s peculiarities, slow to pass doctrinaire judgments, possessing faith in the general decency of mankind, and free from a certain modern tendency to feel that the other man’s ideas need to be purged if one’s own are to survive. On the other hand it is hardly surprising that some of Ike’s visitors haven’t seemed to be able to grasp what he was talking about or be able to agree that his political views as of Paris in the spring of 1952 make him a “middle of the roader.” To them, he has seemed instead to sound like a man “to the right of Taft.” The confusion really arises out of the fad that Ike is not at all to the right of Taft, but rather about 40 years behind Taft in applying his own personal inclinations to the actual problems of America today. Ike simply hasn’t had a chance to apply himself to these matters. Taft has. It is important to compare Taft’s and Eisenhower’s personal inclinations. On any such comparison Taft would certainly be well to the right. But over the past forty years the Senator from Ohio has found it either necessary or desirable to make certain modifications in the application of his personal doctrines to specific conditions, as has Harry Truman. This is a process through which Ike has not yet had the time or need to pass (or rather had not until he found the transition from military to political life looming ahead of him). As an announced candidate, Ike began to do some serious thinking. But being able to regard himself with reasonable objectivity he came quickly to the realization that he was certainly not equipped at this stage to form decisive judgments on such specific current issues as the steel strike. Political instinct seemed to guide him in the same direction, warning him that he had better not mix in too many current issues until he had had a chance to do some home work. The result has been that he has talked to his visitors in the only idiom available to him; the political idiom of Midwest America, circa 1910. The real question, however, is not where his domestic views are to be found today, but how good are the pieces of political equipment he has brought home with him as devices for evolving a useful and constructive set of views of modern fimerica. Most of these are too well known to require more than itemization. His personality and easy friendliness are proverbial, and real. So is his ability to act as chairman or moderator of a board meeting and to lead wrangling individuals towards a workable compromise between conflicting views. No one can take from him the fact that the hammering out of the European Defense Community agreement in one year among Europeans conditioned by a thousand years of war and suspicion borders on the miraculous. Add his ability to express his ideas with an intensity and enthusiasm which actually do arouse public confidence and light little fires of hope and faith. This derives from the fact that he is an optimist with a belief that men are decent and that mankind can move from where it is to some better place. It also derives from an ability unusual in military men to handle words. He did a lot of writing in his day–including General MacArthur’s annual reports as Chief of Staff and some MacArthur speeches in the Philippines. He works long and hard at such tasks and picks words carefully. One is surprised by his vocabulary when moving from conversations with military men around him to conversations with him. These are his political assets. What about his liabilities? There are several minor ones. Like Harry Truman, Ike has had some difficulty avoiding undesirable personal associations. He makes friends easily. He has found it necessary to terminate several such friendships. 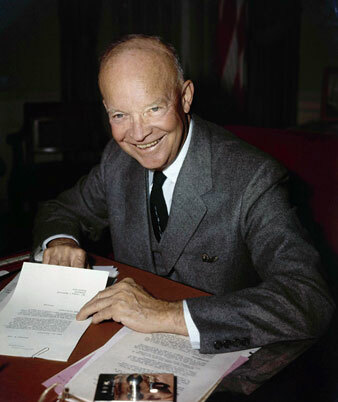 But unlike Truman, Ike can terminate them firmly and decisively. Then Ike moves into the political arena with a skin as yet untoughened to the vulgarities of political behavior. He has been disturbed by the black propaganda campaign waged against him. He wasn’t prepared for being called Communist-lover, lecher, “Swedish Jew,” and husband of a dipsomaniac. He didn’t know that this soft of thing is normal in American political life and that its purpose is as much to rattle him as to influence people against him. It got under his skin and he still can’t talk about these abuses without a touch of visible pain. The question is whether he will develop towards a Rooseveltian delight in collecting specimens or towards a Hoover-like persecution complex, or find a solution peculiar to himself which will be sufficient. Basically an extrovert, the chances are that he will evolve some form of defense. But before he does he may be rattled and thrown off pace several times. Probably Ike’s greatest liability is his sense of being slightly apart and different from even the best of the politicians who built his candidacy. The one person he really trusts in the whole movement is his old personal friend and army associate, General Lucius Clay. So close is the natural sympathy and understanding between them that General Clay was actually used during the predeclaration period as a sort of alter ego for Ike. The politicians, forbidden to ask Ike direct political questions, put them to Clay and Clay gave the answers he assumed Ike would give were he free to give them. And apparently they were almost always the right ones. That same identity of thinking process does not exist with such men as Paul Hoffman and Senator Lodge. They and Ike talk “to” each other rather than “with” each other. They are separated by that delicate but ever present difference between “we” and “they.” They are also separated by the persisting assumption that Ike is more important to them than they to him. It will, be some time, if ever, before Ike can feel as comfortable among his political associates as he does among his old military friends. This could become an asset by protecting him from a narrowly interested advocacy of special causes. As candidate and/or President, he would be better off not to trust his advisers as completely as he has become accustomed to trust his army friends. The sum of it all is that Ike is not as complex as some people are apparently trying to make him, or as “placed” as others assume him to be. Using “good” in its best sense, Ike is a good man with strong urges to lead the country out of twenty years of internal strife along what he regards as the middle of the road. He approaches the task with an unusual personality and a real earnestness. He can contribute a fresh sense of direction just because his political roots are in the Middle West of 1910. Can Ike locate that middle of the road in sufficient time to meet his problems? It won’t be the easiest thing he ever tried to do. And of course there is some question whether the middle he finds will accord with the public’s sense of where it lies. It would be a grave mistake to assume that Ike is already placed to right, left, or center. If the Republicans take him as their candidate, and the voters as their President, they will be taking a man who knows where he wants to find himself but whose present ideas of where it will be are going to sound quaint, if nostalgically charming, to our sophisticated moderns. Perhaps a touch of quaintness is what a lot of Americans really want after Roosevelt’s sophistication and Truman’s mixture of good decision in big things and Pendergastian cynicism in small things.